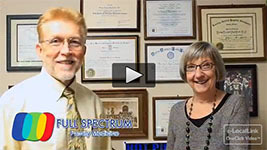 Thank you for your interest in Full Spectrum Family Medicine! We welcome the opportunity to provide you quality care. This website is designed to help answer your questions and familiarize you with our practice. Our practice consists of physicians and other health care professionals who practice integrative medicine. Integrative providers prefer to treat the underlying causes of disease, rather than symptoms alone and to treat patients as individuals. A variety of safe and effective options are employed in diagnoses and treatments. Traditional western medicine is combined with a variety of complementary approaches to benefit the whole person. These approaches may include education for lifestyle changes, manual medicine, including osteopathy and medical acupuncture as well as conventional drugs and surgery. The content of this website is intended to be informational and any information provided on this website should not be interpreted as a recommendation for a specific treatment or course of action. The website does not replace medical consultation or medical professionals for proper medical care or for diagnosis and/or treatment. Our providers do not provide any medical advice on the website. For medical advice or concerns, please contact our office directly. Any information contained on Full Spectrum Family Medicine's website is presented as is, without any warranties of any kind.Clicking on a link to another site will take you away from Full Spectrum Family Medicine website. We do not endorse or control information contained on any linked sites.